If you missed Part IV, you’ll find it HERE. So we learn this painting was actually entitled “ALONE AND FORSAKEN” – at least by artist Vosberg. Get this: A small print can be had for $1.50. That’s right. Click HERE and scroll down until you come to image “SIG425”. 1. Herman Alfred Leonard Wahlberg (1834-1906) – and was given by Lizzie to a handyman. (Provenance describes it as a “picture” so it may not have been an original painting but a print of Wahlberg’s original). 2. Father Arnold Janssen, or Janseen (1837-1909) who was canonized and previously featured in this blog HERE. 3. Heinrich Vosberg (1833-1891) – his paintings are still sold through various art auction houses. He named this one “Alone and Forsaken”. Slide cursor over image when it comes into full view. (There’s music). One of those untold number of prints sold for less than $30 on eBay just recently. The cherrywood frame, circa early 1900’s, and the newsprint behind the frame were worth more than the print. I’ve become less interested about the fact Lizzie gave this painting to a handyman than I am about the genesis of its original creation. Perhaps more readers out there will come forward with *their* original “Alone” painting. I have been meaning to contact you for quite a while. About 10 years ago, I purchased a print of this painting at a flea market in Connecticut. I liked the subject and it reminded me of my property on the lake. A few months later I came across another print, and since then my collection has grown to include seven prints, one not so well done oil on canvas, a black and white etching(with the artist’s name, date and title)and two celluloid boxes with the print on the top. One of the boxes has an inscription on the bottom that indicates it was a Christmas gift 100 years ago. I have had them all displayed on the walls of my dining room for the last several years. The interesting thing for me is that they are all done differently with color and scenery, but they are obviously the same painting. I always scout for this print everywhere I go. It is always so much fun to find another one. I have a framed copy. It is very old with a wood backing, which is something I have never seen. It is a paper print 11-1/2 x 18, in black and white, signed Heinrich Vosberg 1887. What could it be? 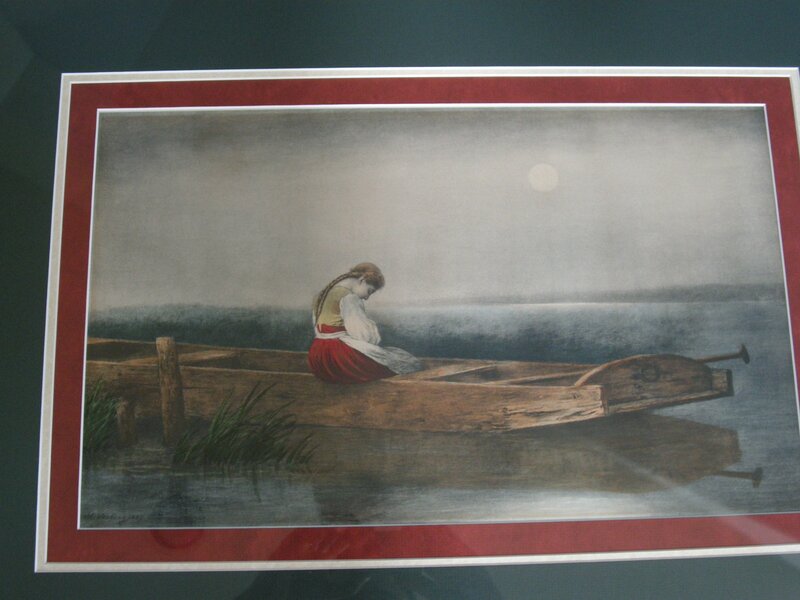 I have a oil painting of a girl in a boat on canvas with a very old wood frame with wedges in the corners.it has a signature signed M.E.Fitz Jayrell.I’m trying to find maybe someone who could lead me in the right direction as of value.916 207 5446. I just found your website. I also have this “print” which I love. It is framed and in a very nice old frame. I bought it in an antigue shop in MN but he didn’t know anything about it. I didn’t want to take it apart to search for a name so have just been searching the web. I just found your website also. I have collected her for the past 40 years. don’t know why I just love her. I have about 28 different prints and oils that amateurs in art class have done. From 1900 on. I also have several celluloid boxes and celluloid photo albums. They are all hanging on one big wall above the fireplace. My husband thinks he lives in a museum. Chimney flue covers, prints, pastels, oils, boxes. What a treat to know that someone else thinks the same. People just shake their heads. I have found alot in ohio, where I was born and some were gifts. I guess I haven’t read far enough yet to know about the handyman story. this is so exciting. It has been hard to find anything about her. The lady I mean. Isn’t she sweet and so sad…. I purchased this painting at a garage sale for $5.00. So happy when I found this site. I am puzzled about the picture that I purchased and wondered if you could tell me anything about it. I cannot figure out how this was painted. It is a piece of rectangular glass, about 10×17 inches. The glass appears to be hand-made (has the uneven ripples). The back of the glass is kind-of “wallpapered” with an old newspaper, from Chicago. The advertisements are from the classifieds re. rooms for rent “with running water” or with “an out-house”, etc. The painting of the sad girl almost appears to be painted onto the glass. I cannot seperate the layer of newspaper and it doesnt appear to be painted on canvas??? Do you have any knowledge as to the type of painting this is? Hi Nancy – No, I’m afraid I do not know how it was painted. All I know about the painting has been posted in the several blog posts I’ve done here. Have you read them all? You may want to email the other owners with your questions – some are paintings and some are just prints. I think it was probably copied many times by other artists and amateur artists and was a very painting. I’m helping a friend research this exact same piece–“Alone and Forsaken,” which seems to be a reverse painting on glass, like what you’re describing, and about the same size. Have you found any more information on yours? Hi, I have a oil painting, on canvas, dated 1906 & signed O. (or G.) Boimare of this SAME subject, a girl alone in a row boat, with the sun set in the back ground. The signature is on the right side. However, There is a tree painted in on the left side in the fore ground with leaves. The realistic style is the same and the mood is fulled with sadness, just as Vosberg. I have never found anything on Boimare and hope someone could help me. If you have a comment about this please mention the artist name in the SUBJECT when emailing, or write to Mary, PO Box 42, Chichester, NY 12416. I have this picture, too. 10 x 17. Vosberg signature 1887. I found it in a 5th generation homestead farmhouse. Behind the framed print was a land grant dated October 1, 1857, signed by President James Buchanan for acerage in the Kansas Territory inhabited by the Deleware Indian Tribe. Obtained by the United States through a treaty with the Deleware who maintained residence along with the new landowner on said property. Please don’t hesitate to contact me. I purchased a reverse painting on glass approx 10 years ago at an auction no signature, just the word alone written in pencil on the back. framed in a small link chain all around picture which measures 8″x14″. could you provide any info to the possible value? Sorry for the repeat comment I forgot to check comments via e-mail!! My Mother painted when she was young and painted her version of this painting. It’s my favorite of all her paintings and I now own it. Have been trying to find out who painted the original when I found this website. Unfortunatly my Mom has Alzheimers and is unable to tell me now where she copied the painting from. She will be 93 this year and probably painted it when she was in her 20’s. I purchased this picture yesterday for $2 at thift store. Original matting with H Vosberg impressed on back of matting and M E Sheahan Publishing Bsoton Mass. They closed in 1909. I love it. Beautiful colors. Have the same painting and recently had it restored. It is an oil on canvas 53″x38″. I love it. I inherited it from my grandmother and it hung in her house for her 100 years of life as it was her fathers painting. Our sis unsigned but was appraised at $7,000. I have a oil painting 17×32 with signed m.e. Fitz jayyoll .can’t find out what its worth. I, too, have an “original” Alone painting, It is reverse glass with a chain frame, painted in somber colors, 8″ X 14″. It came from my grandmother who lived in Philadelphia. I purchased an old painting, 9 x 17 about 15 years ago at an estate sale. The family traveled in Europe and brought back several paintings. Mine is on a very old stretcher, very dark and dry. the painting has 3 repair patches on back and could use a professional cleaning to lighten her up! To all of us who have an “original” of this painting — Alone and Foresaken, let’s raise a toast to the genius that originally painted the first original! Merry Christmas! It’s not worth much, John. There’s hundreds and hundreds, possibly thousands, out there. Did you read all of the postings and comments on my blog relative to this painting? Sorry for my poor photography/uploading skills but -here you go. This is the version of this exact picture my great-great grandmother painted at the end of the 1800’s. We hadn’t realized it was a copy of someone else’s picture until we saw another copy in a restaraunt. So the question is why was this particular painting so popular that everyone seems to have a version some relative painted? She wasn’t well traveled – I don’t know if she had ever been to the east coast or Europe. 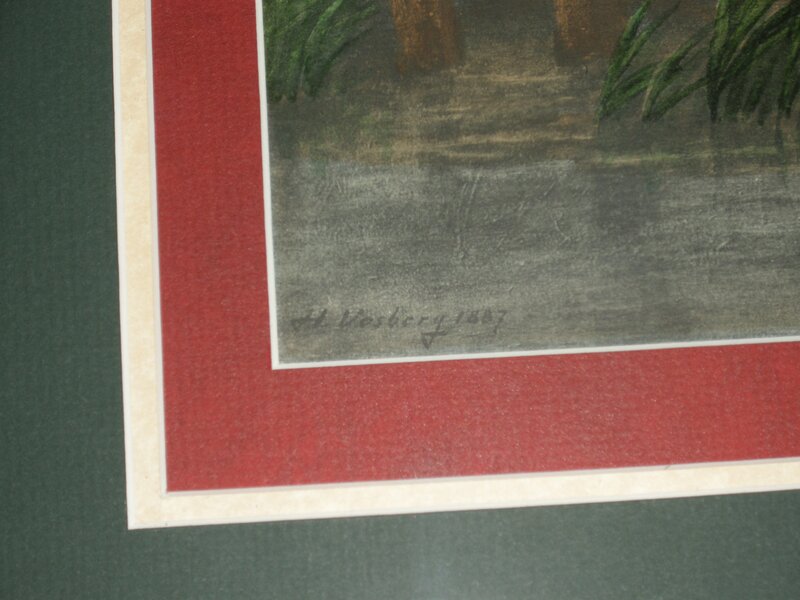 Here’s her version of the painting – the signature on it is her name, not the artist she copied. I bought this painting at an antique store in Redlands,CA. It is painted on a piece of wood and framed. It is unsigned. And is such a mystery. I too am uplifted by this painting as done in oil on board by my Grandmother when a fine arts student at what was then named, Ontario Ladies’ College, Whitby, Ontario, 1890. She chose to title it ” Solitude”. It was framed atop one of the panels in a 4 panel hinged oak floor screen depicting the four seasons. Ive read some very Interesting commentaries concerning this painting. I just happen to purchase the same painting, it’s an oil painting on canvas dated 1725. Could be the original?? Currently in progress of looking into a reputable art firm to get validation and a professional appraisal done. Will update this site accordingly. Thank! The painting is signed and dated 1725. YES I WROTE 1725! The signature which is located on the bottom right hand corner is slightly difficult to read due to your normal wear and tear of age. I haven’t been able to find this artist online perhaps cause I may be reading it wrong. After researching numerous articles and completing a full visible inspection of the canvas, stretcher bar, framing, I strongly feel that this painting is the original and the artist is NOT Heinrich Vosberg as the majority has claimed. Who knows if the title of this painting is even accurate. It was framed by Oliver & Company. I will be able to verify this painting once examined by a professional. We have a 24″ x 36″ oil on canvas signed and dated on the bottom right by M. Mullally, 1896. It was bought in the late 60s in Canada. Does anyone know anything about this artist? I’ve had one of these paintings for about a year. I already was aware that others exist. Found it on the Oregon coast. Stretcher bar and frame appear to be turn of the century to slightly earlier…..
Last week I was visiting family in Florida and visited the Morse museum in Winter Park. There is an antique shop right next door that had an oil on canvas copy. Slightly smaller and not quite as nicely painted. We have a very old oil on canvas by artist N. Canonico. Anyone have information on it?